We'll be tying a slight variation of the pattern due to available materials, but the finished product should match up well! 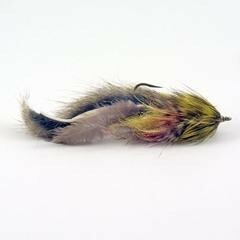 This is an under appreciated, and frankly ugly looking streamer patter that happens to be very effective in Montana. In my experience it tends to fish better dead-drifted or swung. Here's a link to a video on how to tie: https://www.youtube.com/watch?v=6CjM-IIvHbA.